The extensively updated Second Edition of Case Studies Through the Health Care Continuum: A Workbook for the Occupational Therapy Student is a versatile resource that focuses on assisting students through the use of case studies. Through these 34 cases, students learn about the many possible choices in the clinical decision-making process, and how these different choices can lead to many equally successful outcomes. Case Studies Through the Health Care Continuum, Second Edition by Nancy Lowenstein and Patricia Halloran encompasses new and revised case studies across the health care continuum, from early intervention to older adults. These cases involve situations that students might encounter during their interventions and require them to think about issues that might occur to disrupt their original intervention plan. Inside Case Studies Through the Health Care Continuum Second Edition, new questions on theory and evidence will allow students to think of theory-driven and evidence-based practice concepts, as well as search the literature to support their interventions. Care was also taken to avoid using a specific frame of reference or theoretical model to enable instructors to use various frames of reference and theories with different cases. 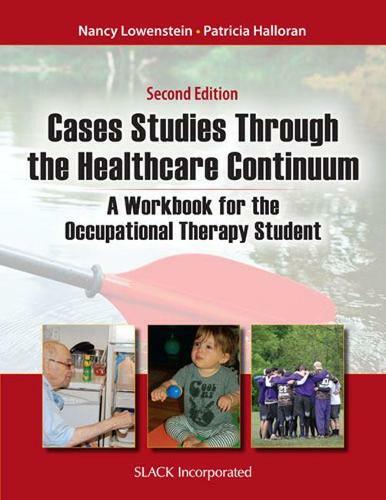 Case Studies Through the Health Care Continuum: A Workbook for the Occupational Therapy Student, Second Edition is a valuable learning tool for any occupational therapy or occupational therapy assistant student as it provides a way to put theories and clinical reasoning into practice through the use of case studies. This is an invaluable revision of the 2000 edition that provides necessary updates to reflect the development of the Occupational Therapy Practice Framework, evidence-based practice, and recent changes in practice such as primary care. The sheer number of case scenarios makes this book different from all of the rest. - Ashley Fecht, OTD, OTR/L, "Touro University Nevada, Doody s Book Review Service""
"This is an invaluable revision of the 2000 edition that provides necessary updates to reflect the development of the Occupational Therapy Practice Framework, evidence-based practice, and recent changes in practice such as primary care. The sheer number of case scenarios makes this book different from all of the rest."